The kidney bean is red in color and shaped, well like a kidney. The pinto bean is brown and is also shaped like a kidney. These beans are most commonly found in the American version of chili, and they are really great finger foods for your baby. The easiest way to serve them is just right out of a can! But, you will have an entire can of beans to use up before they go bad. We have included an easy bean salad to use up all those beans that your baby will not be able to eat. Just buy cans of beans. 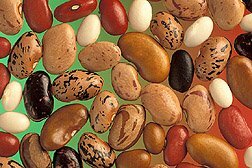 Cooking beans from their dried state is very time consuming unless you have a pressure cooker. There is a little added salt in the can, but that shouldn't concern you. Also, canned beans retain their vitamins and minerals. Open can and rinse beans for easy baby pick up and to wash off the added salt. Store the leftovers in a plastic container in the refrigerator. Cold beans can just be tossed onto any salad to add a texture and bit of flavor. Here is a simple bean salad that baby might even enjoy.